Glucosamine For Dogs: What Are The Best Sources? Home > Blog > Remedies > Glucosamine For Dogs: What Are The Best Sources? Just about any veterinarian you meet will recommend glucosamine to support your dog’s joints, especially if she’s beginning to get a little stiff or achy with arthritis. Most of these vets have a product to sell you … a supplement like Cosequin or Dasuquin. If your dog’s starting to lose mobility, your vet may even suggest an injectable source of glucosamine like Adequan. Here’s an example of recommendations from Colorado State University’s Veterinary Teaching Hospital’s website. First of all, what is glucosamine and what does it do in the body? Glucosamine is actually a combination name made up of glutamine (an amino acid) and glucose (a sugar). Your dog’s body naturally produces its own glucosamine. It’s a substance that helps create molecules that form the cartilage of your dog’s joints. As your dog ages, the body produces less glucosamine so joints can stiffen up and lose their shock absorbing cartilage. This is why you might consider using glucosamine to maintain her mobility. Glucosamine sulfate: this is the most common type of glucosamine used in supplements, and the one that’s been most thoroughly researched. It’s extracted from the shells of shellfish or produced synthetically in a lab. It contains sulfur, which is the component that helps build and repair cartilage. NAG – N-Acetyl-Glucosamine: this form of glucosamine is a derivative of glucose the body’s precursor to hyaluronic acid, which is part of the synovial fluid that lubricates joints. NAG can be used for both joint and gastrointestinal issues. In joint support products, glucosamine is often combined with other ingredients like chondroitin or MSM (methylsulfonylmethane), both of which can help maintain the cartilage in your dog’s joints. Glucosamine has natural anti-inflammatory properties, making it a very popular supplement for people and pets with joint pain or stiffness. Supplementing with glucosamine can help improve mobility and range of motion, and slow the aging process in your dog’s joints. Glucosamine has a great reputation for helping joints. .What you may not know is that glucosamine can also help with gut health. The type of glucosamine that helps with gut health is NAG (N-Acetyl-Glucosamine). It helps create connective tissue and repair mucous membranes that form the barrier of the gastrointestinal system. It’s been shown to reduce inflammation in the digestive tract and improve irritable bowel disease symptoms. It can also support the immune system, 80% of which lives in the gut. So it seems like a great idea to give your dog glucosamine. But do you really need to buy those expensive veterinary supplements? Why Not Give Veterinary Glucosamine Supplements? Veterinary glucosamine supplements are all expensive, and most are synthetically produced, not from natural sources. One of the problems with synthetic supplements is that the cells in your dog’s body may not recognize or absorb them as they would a natural nutrient. According to veterinarian Dr Jodie Gruenstern, your dog’s cells have receptor sites for the attachment of biologic factors that turn cellular functions on and off. These receptors can become clogged with lookalike nutrients. When your dog first starts taking a synthetic supplement, you may notice some initial improvement. This is because at first the receptor sites are empty and desperate for the nutrient. But when the receptors become clogged with the inadequately functioning synthetic nutrients, the cell receptors can’t function properly. Your dog may feel great after beginning a new synthetic supplement, only for the original symptoms to return after taking it for a while. Some commercial dog foods claim to promote joint support because they contain glucosamine. But beware these claims, because the amount of glucosamine in most kibbles is far less than your dog would need to help her joints. A 50 lb dog would need about 1000 mg of glucosamine supplement a day, but with some kibbles you’d need to feed more than 20 cups of food a day to get this amount! Read more about glucosamine in kibble. So what’s the best way to give your dog glucosamine from a natural source? … Try feeding glucosamine-rich whole foods. Just like us, our dogs have naturally occurring glucosamine in our bodies, so do the animals we use for our dogs’ meat. There are lots of delicious foods you can give your dog to provide her with natural sources of glucosamine. Bioavailability refers to the amount of any nutrient (or drug) that gets into systemic circulation so the body can use it. The good news is that the glucosamine your dog gets from food is readily absorbed and put to good use. Because it’s “just food,” the body knows what to do with it, and will need much less of it to be effective, compared to a synthetic supplement. When you’re giving a supplement, dogs need about 500 mg of glucosamine per day, per 25 lbs of body weight. But don’t worry about how many grams of glucosamine your dog’s getting through her food. Just feed some of these foods regularly and your dog will get plenty of natural glucosamine. For example, one of the foods listed below – beef trachea – is mostly cartilage, which contains about 5% glucosamine. A 1 oz piece of trachea (about 28 grams) will provide your dog with over 1400 mg of glucosamine. Or take another food, chicken feet … just one chicken foot contains about 400 mg of glucosamine. Always feed raw for maximum nutritional benefits and don’t ever give your dog cooked bones of any kind. Trachea is made up of cartilage, which is rich in glucosamine. Beef trachea is the easiest to find, but some raw dog food suppliers have lamb, goat or ostrich trachea. All of these are a great chewy meal or snack fed raw, but you can also dehydrate them for a crunchy nutritious snack. Remember earlier I mentioned Adequan, a prescription injectable (and very expensive) form of glucosamine that many vets recommend? Check out this information from the product insert. Yes, Adequan is extracted from beef trachea. Giving your dog a chewy beef trachea meal provides glucosamine in a more bioavailable (not to mention fun and tasty) way than giving your dog intramuscular shots every few days! Chicken feet are loaded with natural glucosamine. Chicken feet make a yummy crunchy snack or can be part of your dog’s meal. You can also feed other poultry feet such as duck, turkey, goose or guinea fowl. Tails are made up of cartilage surrounded by some meat. Cartilage is 5% glucosamine so oxtails (beef) or pig tails are another good way to give your dog a healthy meal with plenty of glucosamine. Beef knuckle bones have lots of cartilage and dogs love gnawing on these big bones … so they can provide hours of entertainment as well as a valuable source of glucosamine. Here are some nice raw bones with good cartilage at each end. Shellfish shells are a source of glucosamine and if you can buy wild shrimp with the shells on, you can feed them to your dog. Or have them yourself for dinner and share them with your dog by giving her the tails. You can also make the shells into a nutritious broth by simmering them in water for a few hours! Beware grocery store shrimp as the labeling is notoriously unreliable and the shrimp is often farm raised, which means it probably contains pesticides and antibiotics. Make sure you buy your shrimp from a trustworthy source. Green lipped mussels contain high levels of glucosamine and they’ve been shown to reduce arthritis discomfort in people and animals. They’re from New Zealand so it’s hard to find them fresh, but you can buy green lipped mussel powders for dogs. Make sure the product is cold extracted as heat destroys the nutrients. Give 15 mg of powder per lb of your dog’s body weight per day. Or buy freeze dried green lipped mussel treats and give 2 mussels for every 10 lbs of body weight per day. Making a rich, gelatinous bone broth is another wonderful way to give your dog natural glucosamine. It’s easy to make even though it needs to spend 24 hours or so simmering on the stove (or in a slow cooker). Bone broth has countless health benefits, and it’s loaded with glucosamine and other joint-supporting nutrients. Fill your pot (or slow cooker) with bones. Choose bones with cartilage in them (like the ones listed above … chicken feet, oxtails, etc. ), preferably grass fed bones. You can also use your own leftover bones – it’s fine to use cooked bones in your broth too. 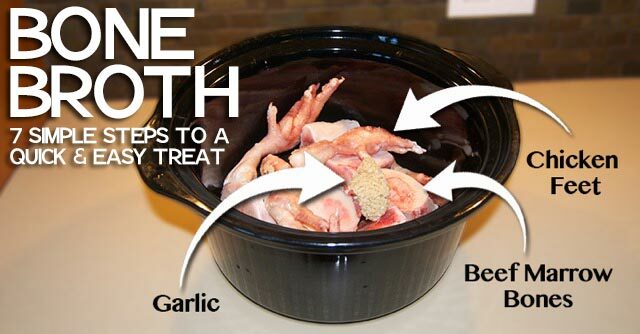 Fill the pot with filtered water to cover the bones. Leave it to cook for at least 24 hours or longer. If you leave it longer you may need to add more water. Feel free to include some veggies and herbs for extra nutrition – you can add these a couple of hours before the end of the cooking time. Strain the bones and chill your broth in the refrigerator. If a layer of fat forms on the top you can easily remove it once it hardens. You can also freeze extra portions in mason jars. Add some broth to your dog’s meals or feed it as an extra snack. The amount isn’t important (it’s just food!) but a few tablespoons of the gelatinous broth added to your dog’s meals will provide many health benefits, especially for her joints. Find a more detailed bone broth recipe here. Here are a few other foods you can add to your dog’s meals to help her joints. The bright orange-yellow spice turmeric has anti-inflammatory and antioxidant properties that can help reduce joint pain. A study in humans showed curcumin, the main constituent in turmeric, to be as effective as ibuprofen* in reducing discomfort in patients with knee osteoarthritis. *Important Note: This was a human study. It’s not safe to give your dog ibuprofen so please don’t ever do that. It’s best to buy organic turmeric at a health food store rather than grocery store turmeric. Grocery store turmeric usually only contains 2% to 4% curcumin by weight and may be grown using pesticides. Look for products standardized for 95% curcuminoids. Also, it’s a good idea to buy a product that contains black pepper or piperine (that’s what gives black pepper its pungency), which may help with absorption. You can also buy the fresh turmeric root and crush it, in which case it’s also wise to add a little black pepper to aid absorption. Add turmeric to your dog’s food, giving ⅛ to ¼ tsp per day per 10 lbs of your dog’s body weight. Cautions: Turmeric is generally considered safe, but you may want to check with your holistic vet before using it. It can interact with other medications, especially NSAIDs and blood thinning drugs, and for a patient undergoing cancer treatment, it may interfere with certain cancer drugs. High doses have also been known to cause liver problems, and turmeric should not be used during pregnancy as it may cause premature uterus contractions leading to miscarriage. Read more about turmeric for dogs. Using raw ginger root (available at most grocery stores), remove the skin with a paring knife or peeler and finely mince the root. Mix it into your dog’s food, giving ¼ tsp for miniature breeds, ½ tsp for dogs up to 35 lbs and ¾ tsp for larger dogs. The flavor is quite strong so you may want to start with a smaller dose until your dog gets used to it. Blueberries contain many powerful nutrients, including high levels of anthocyanins. Anthocyanins are antioxidants that can help minimize inflammation by fighting free radicals. Free radicals are unstable molecules that cause oxidative damage in the body, leading to chronic inflammation and disease. Most fruits contain three or four types of anthocyanins, but blueberries have a whopping 20 different kinds, making them a true superfood when it comes to keeping your dog’s joints healthy. Give your dog a few blueberries in his food or as a treat or snack. You can give them fresh or frozen … when frozen they make a nice crunchy treat! Start gradually if your dog’s not used to blueberries, as they contain lots of fiber that may cause loose stool at first. There are many natural ways to support your dog’s joints without resorting to synthetic supplements. Try a few of these foods to keep your dog mobile and pain free!